Can a whole week have passed? And I can barely remember Christmas! It's not that it was such a whirl, although I did make a couple trips to and from Fredericton. The 5 days that my daughter, Caley, was here were nice; even though I wasn't feeling the best, we spent some good time together. She made cookies and cooked us 2 dinners. Every year I barely make it to Christmas and then I spend my holidays trying to recuperate. This year I saw the family Dr who ordered tests and even then I had to make 2 trips to emergency for my breathing. I caught a mild bug from my students that caused a cough and a sore throat, but it dragged on and then affected my breathing. On the trip back with my daughter we took the long way via Moncton, so that we could meet with my oldest son Jesse and his partner Karine for a meal since they spent Christmas at her parents. We then stayed at my daughter's for the night and took our car into the Subaru dealer there first thing Mon morning for some major maintenance that couldn't be done here. A four hour job turned into a day and a half, another night night and $2100 instead of $600. Reading back over this it all sounds a little depressing, but really the family time was nice. We were very careful about our spending this year. My youngest son donated gifts to a charity in our name and was thoughtful enough to choose something to suit our interests and give us each a card with the picture of the gift in it. He donated books for me, a radio controlled race car for my husband, and a Bratz doll for my daughter. So, when the car repairs hit, it wasn't nice but more doable because we hadn't overspent. Christmas just seemed to mean more when it involved less gifting. My last 2 New Year's I've decided to commit to being more creative each day or even a little each week. 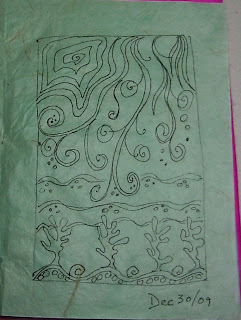 I have just finished up 2 journals, so I feel that I have accomplished something. I won't be making a new resolution. I want to continue simplifying my life, spending less, and creating more. In response to that I did a small 10 minute doodle last night as my pledge. Today, I have to do errands, some groceries, and a little clean up, meaning there won't be much time to get into my studio. That's life though. I'm hoping to get some time in the next couple of days, and I'll try to post some better pictures. If any readers out there struggle with adrenal insufficiency and immune system problems, I'd love to hear how you cope. Yesterday I made the trip to Fredericton and back to get my daughter. I think I got very lucky with my timing, as there were accounts of snow and drizzle, but I managed to miss them. It was snowing as I drove into the city; however, by the time we were heading home, it was raining. I'm still not feeling well; I had a chest xray which came back clear. I just cannot get my breathing under control even though I increased my cortisone. I have an appointment for a blood test at 6:30 am on Thurs morning and if I'm still like this I may pop into emergency to be checked again. I haven't had asthma trouble like this in years. Oh well, it is making me slow down and it does serve to remind me of what is important in life. I'm feeling too low to keep up with my usual activities, so I sat on the sofa last night and watched a couple of shows with my daughter. Her taste in shows is nothing like mine; in fact I thought it was pretty bad, but it was still quality time together. It didn't have to be some great Christmas show or a touching movie. I think sometimes we expect too much, and when you let things unfold without the stress and big expectations there is no disappointment. It was nice just to quietly be together. Today , I tried to take it easy--it's hard to move quickly when you can't breathe. My daughter made her favorite cookies while I talked and did a few small things. I think she did a better job than I would have. I was so excited today when I checked my mail and there was a card in it postmarked from the West Indies. I participated in an art Christmas card swap and it finally arrived. Isn't it great? I've included a photo of a t-shirt that I just finished on the weekend for my husband. 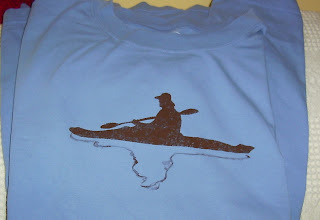 I traced the outline from a photo from one of our kayaking trips, enlarged it, traced it onto freezer paper and ironed it to the t-shirt. Then I stenciled it with fabric paint. I still have to heat set it. I really like it...just hope it will stand up to lots of washings. I'm still not really feeling any better. Whatever the bug is, I feel not so bad in the daytime, though, tired and achy, but at night I have to take cough medicine before bed. Today was such a lovely day that I decided to I needed to get outside. We snowshoed with our friends to Chickadee Junction where we ate peanut butter and banana sandwiches before turning back. I had my camera, but the birds must have been well fed because they kept their distance. Yesterday, I managed to get my tabletop tree up and I'm quite happy with it. I put my hydrangea blossoms that I cut in the fall on it and I used mostly lime green and turquoise ornaments. Also, to be different this year, I found white pom poms at Walmart. The picture doesn't really do it justice. Tomorrow morning is my first day of Christmas break, and I'm getting up at the usual 6:30am so I can be on the road to Fredericton to bring my daughter home. I'm hoping to have time to stop at Chapter's and maybe Micheal's. I don't like to travel after dark though, so I won't have much time. Things are slowing down around here. Whether it's the cold, the increasingly shorter days, the adjustments I keep having to make to my cortisone, or a combination of all three, I'm for sure slowing down. I just don't have the same energy to create when I come home from work. 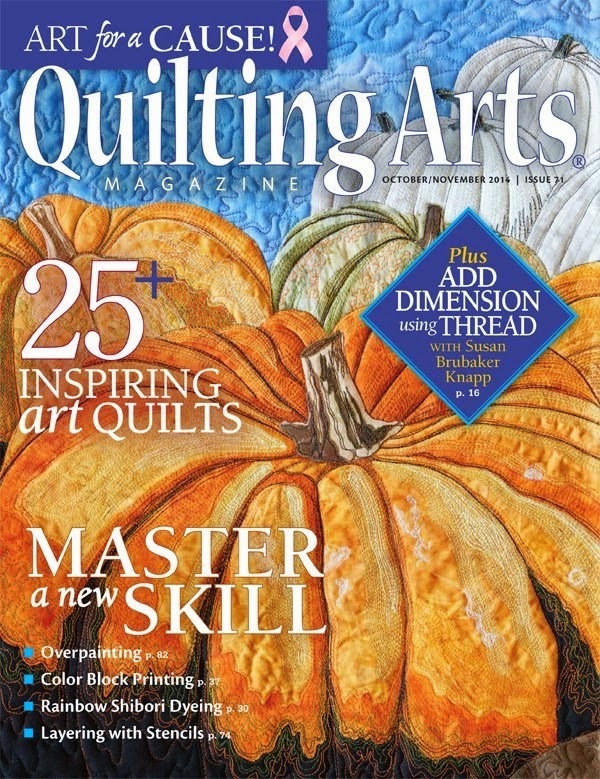 I feel like curling up with a book which I don't usually do until bedtime, or watching a show while knitting. I'm not especially creative with my knitting, often sticking to basic socks or afghans. I do find the mindless repetitiveness very soothing though and sometimes meditative. 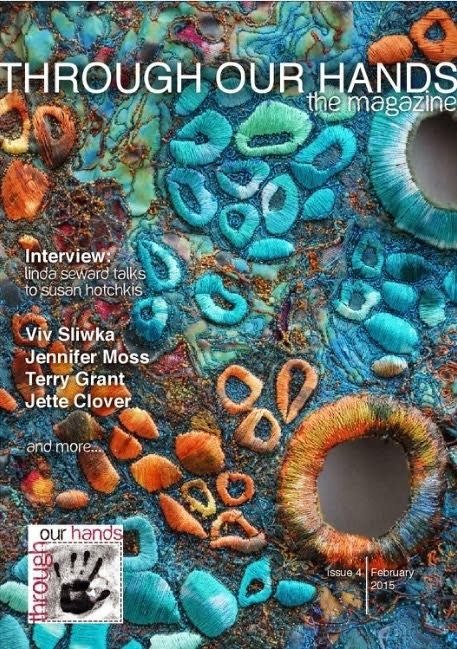 There have been times when I was agitated or anxious when I picked up my knitting, and after about 10 minutes I felt that the tension had left my body. 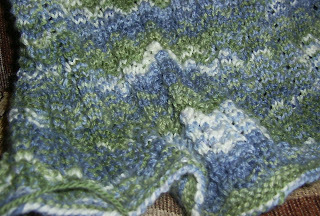 To-night's picture is of an afghan that I'm currently knitting. I'm using a Paton's Decor with 25% wool. I got the borders on the the little Repro baby quilt, and I must say that I quite like it. Also, I heard that our guild's UFO day next Sat is still on, so I may take it and sandwich it and even perhaps start to machine quilt it. It's pictured sideways below; I just realized I forgot to turn the photo. When my daughter comes home on the 21st she will stay on the hide-a-bed in the rec room for a couple nights I think until my youngest son comes. Then she will move up to my sewing room (once her bedroom). I have a little desk in my bedroom which I will put my little Jem gold on in case I feel the need to do a little sewing over the holiday while I'm off for two weeks. I'm not sure how much time I'll have because we are hoping to do a day of skiing. I will drive the 3 hours to Fredericton to pick Caley up and I believe my husband and I will both take her back around the 28/29th. so, that's 3 days, and I may make a trip to meet up with my oldest sone sometime too. You never know when the itch to do a little something will hit though, so I'll be prepared. After lunch today we went for a walk on one of our favorite woods trails. The temperature had come up from a -13 Celsius in the morning to a -8 at lunch time, and there was no wind, so it was a lovely 1 1/2 hour walk. We debated taking the snowshoes; someone had already been out with them though and packed the snow down some, so it wasn't bad to walk with boots. Next time we'll wear them and take our lunch. We didn't get any pictures today because we didn't stop. 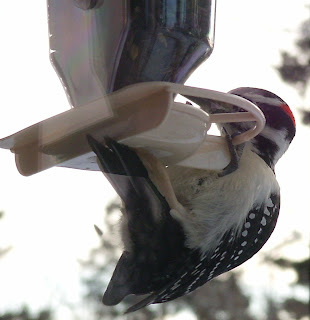 I was surprised though by this woodpecker --hairy I believe-- at my window feeder this morning. It was hanging on for dear life and did not seem to mind me taking it's picture at all. I was only about a foot or so away. 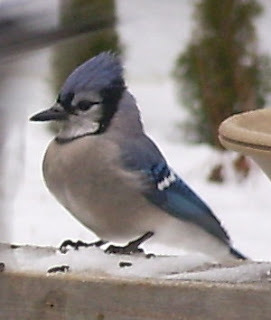 The feeder is on my kitchen window right in front of my sink. I love it! Today was the first storm day of the school year. I was hoping for it because I've been feeling a little sub par with a sore throat and a bit of a cough. I was up early due to said cough, so I had my breakfast and mixed up a bread dough. It was a recipe I pulled off the net with barley, rye and spelt flours. It was OK, but a little dry --could be something to do with the fact that it called for lecithin and I didn't have any. It wasn't beautiful, so no pictures. I did try to take some pictures of the birds outside my kitchen window, and those didn't turn out either. I think I should have been using the macro setting. I'm putting one below so you can at least see the snow we had. I usually do as much as I can get in when I have an unexpected free day; however, today I spent some time on the sofa with my knitting and crocheting. I don't know what people find to watch in the daytime! It's not so easy to get into the Christmas spirit when the children are grown up and away and both partners are working full time. Today, however, I started to get a little niggle. It was snowing for starters, and hubby and I put the outdoor lights up. Then I made gingerbread cookies. To be different this year, I cut them all round and frosted them like snowflakes as you can see in the picture. What I really cherish, though, is that I could smell the ginger and spice smell all day. What makes that really special for me is that I usually live with no smell whatsoever, but right now I'm on a slightly increased dose of cortisone which has allowed me to smell again. Yesterday was our guilds UFO day at the seniors room in the arena. I always enjoy going and even if I can't spend the whole day, I go for a while and also take my lunch. It's nice to keep in touch with everyone since I work all week and don't get to socialize. I got my baby quilt put together, and then my friend Anne and I drove the 1/2 hour to a newish quilt shop. They are having a clearance sale before they close for renovations. I picked up 2 fabrics for the borders. 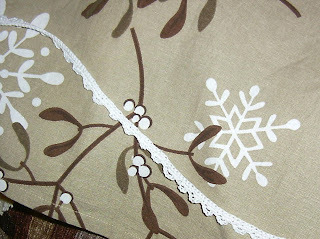 It was not the perfect fabric; I would have liked a darker color for the first border. I want to get it done, and the next shop visit could only be after Christmas. My art supply order arrived today. I placed an order for some paper and a couple things requested by friends, and I decided to try the new Inktense pencils by Derwent. I had a quick try out on watercolor paper to see what they are like, and you can see the results below. As usual my picture doesn't do it justice. The flash made it too washed out, and without the flash it's a little dark, but seemed to show the color the best. Wow, it really is intense color. They go on like watercolor pencils only they feeel a little creamier. When the water is added they are more intense than watercolor pencils, and according to the directions they are permanent once dry unlike the watercolor pencils. 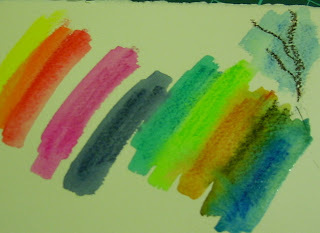 Also, I tried painting over an oil pastel and it still works as a resist as you can see in the top right corner. These are going to be fun! What I'd like to know is where do some people get the time and energy to carry on a life after work hours! And how does one balance everything else that one needs to do, like stay in shape? Last night I did the biking, weights, and yoga thing again. Then I put on the pyjamas, put on the TV and picked up my knitting-- a pretty full night wouldn't you agree? still I haven't sewn a thread all week. 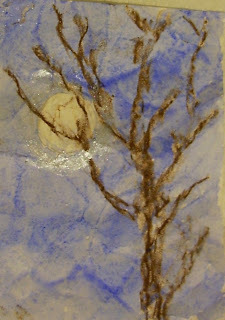 To-night I was very tempted to veg out all night, but I did a few clean chores just to get moving, read a few blogs and was inspired to start this little painting of winter trees. I'm thinking of joining in on a painted Christmas card swap and I wanted to try out something before I commit. (In case it doesn't work). It's not finished yet--the paint was still wet. 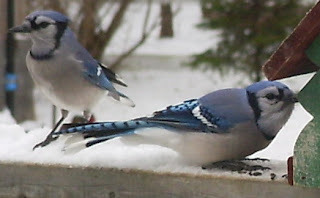 When I took the picture and uploaded it to my computer, I found these pictures of blue jays at our deck feeder that my husband took a t lunch time today.Aren't they cute?